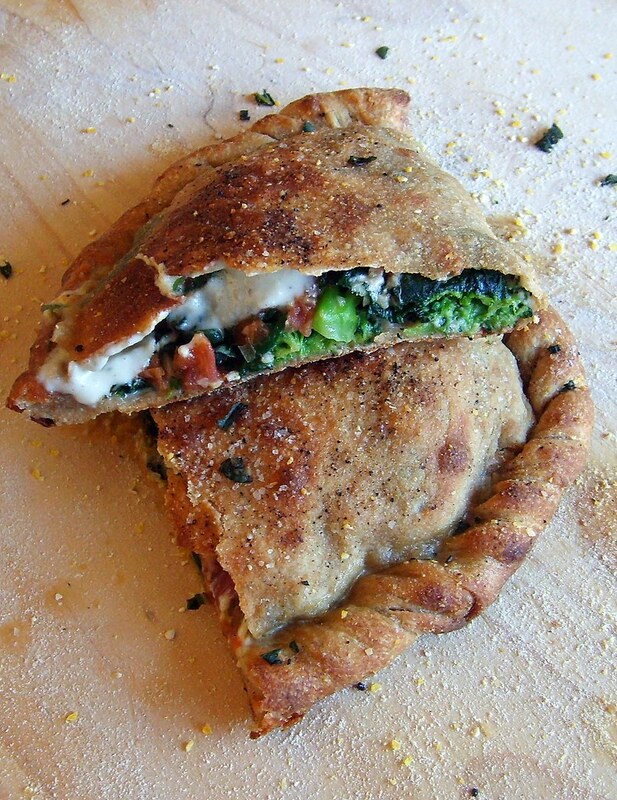 If you like garlic then this calzone is for you! This recipe contains two whole bulbs of garlic! And if you're tired of using a standard red sauce for calzone's or pizza, then I really think that you'll love my Roasted Garlic Cream. Preheat oven to 400 degrees. Slice top off garlic bulb, drizzle with olive oil, sprinkle with salt and pepper and wrap in aluminum foil. Roast in the oven for about 40-50 minutes until tender. Set aside to let cool. Drain soaking water from cashews and place cashews in a blender. Add filtered water and blend for about 3-4 minutes on high until smooth. Heat a sauce pan on medium heat and saute onions, garlic and thyme until onions are soft. Add cashew cream, salt and pepper to taste and cook on low for about 15 minutes until sauce becomes thick, stirring frequently to prevent burning. Set aside. Note: You can use diced canned tomatoes, but since tomatoes are in season, it really makes a difference using fresh. Fill a sauce pan with water and bring it to a boil. Slice an X on the top of each tomato and immerse in the boiling water until skins start to peel, about 30 seconds. Remove tomatoes and place in ice water to cool, or rinse under cool water. Peel tomatoes, slice in quarters, remove seeds and then dice. Add olive oil to a sauce pan, add diced tomatoes, garlic, basil, salt and pepper to taste and cook until liquid is absorbed and tomato sauce is thick. Set aside. Preheat oven to 500 degrees and preheat pizza stone for about one hour before using. Let pizza dough come to room temperature for 30 minutes and then divide into 4 equal portions, roll into balls on a floured surface and cover and let sit for another 30 minutes for gluten to relax before rolling out. Place broccoli florets in a steamer and steam for about 1-2 minutes until crisp-tender. Cool and then chop into 1/2" pieces. Set aside. Heat a large saute pan on medium-low, add olive oil, garlic, spinach, salt and pepper to taste and cook until wilted. Place spinach in a strainer and press with the back of a spoon to remove most liquid, set aside. Roll out pizza dough to about an 8" circle, or to desired thickness and then transfer dough to pizza peel dusted with cornmeal to prevent sticking. Place about 2-3 tbsp roasted garlic cream sauce on the bottom half of the circle. Top with chopped broccoli, sauteed spinach, 2-3 tbsp tomato concasse and 1/4 cup Daiya cheese. Fold over top and seal edges tightly. Brush with a little olive oil and sprinkle with kosher salt and black pepper. Bake for about 7-10 minutes (depending on your oven) until puffy, bubbly and golden brown. When is the roasted garlic added to the cream sauce? You add it to the blender when blending the cashew cream.